Jake was picked to be a Brand Rep for Nuby a couple of months ago, and the timing couldn’t have been more perfect. 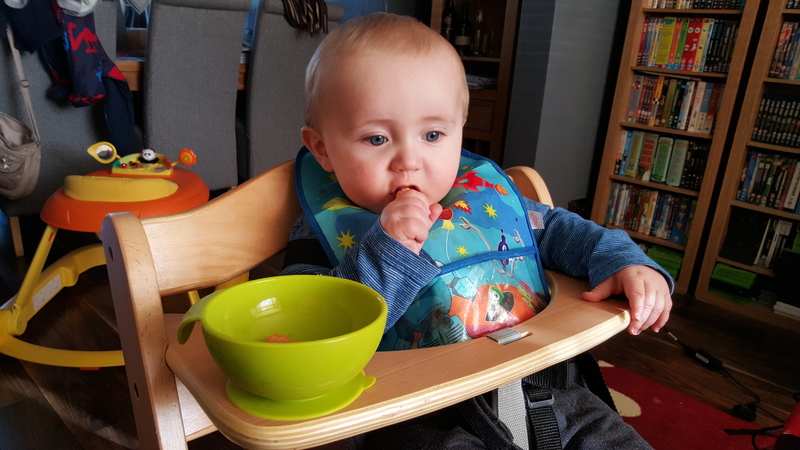 With teething and weaning coinciding as they so often do, I was thrilled to be able to try out some of Nuby’s teethers and baby tableware from their extensive range. And so was Jake! 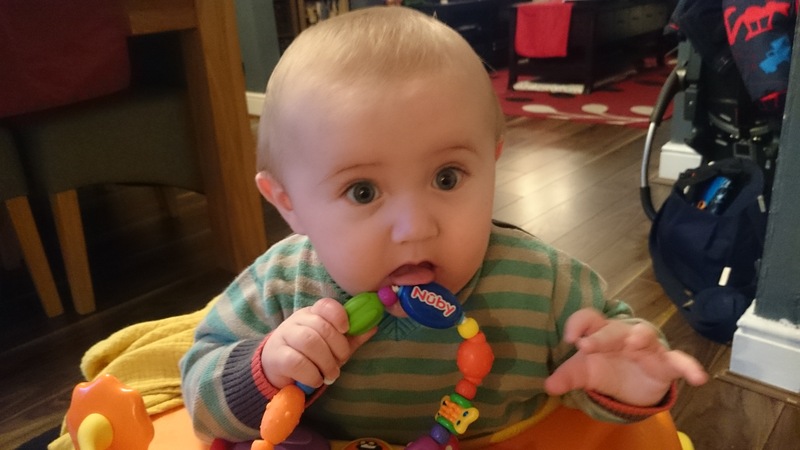 His IcyBite Keys and BugaLoop teether toy have rarely been out of his hands in the last few weeks, and heaven help us if we forget to put them in the changing bag when we go out! 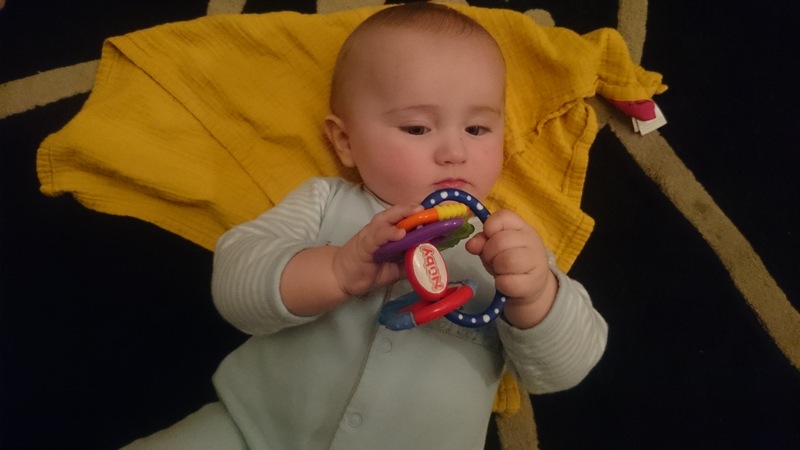 They are easy to hold with little hands and the varied textures and bright colours are perfect for keeping him entertained – not to mention the relief he gets from chomping on them. The Keys can be put in the fridge to cool the gel inside, giving welcome relief for sore gums. 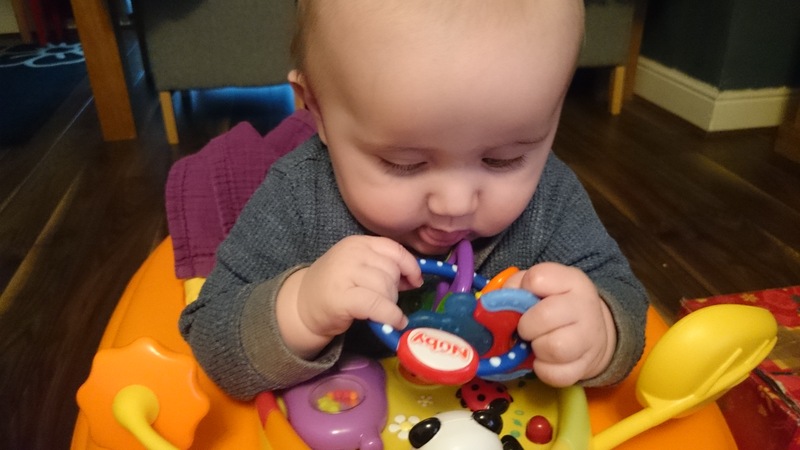 As for weaning, Jake has been enjoying both spoon feeding with the Hot Safe Spoons, which change colour if the food’s too hot, and finger foods from his Sure Grip Bowl and Miracle Mat Plate. 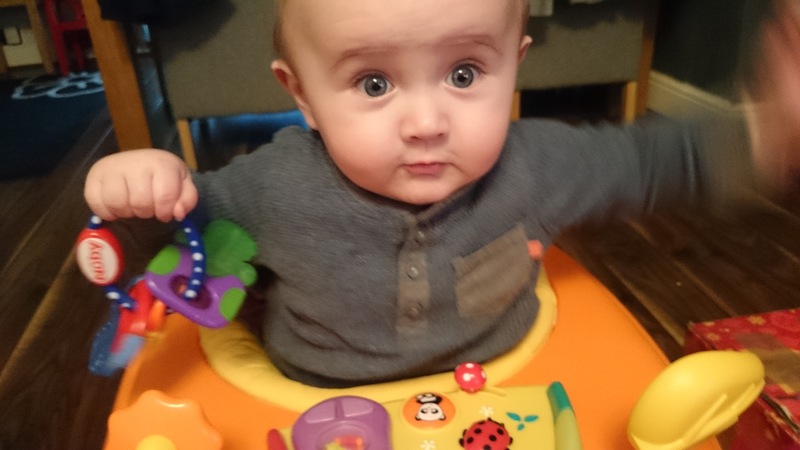 The amazing Sure Grip range is a collection of flexible silicone tableware which is oven, microwave and damage proof, and also cleverly grips to the table or high chair tray so that try as he might, he can’t send the thing flying across the room – although he can still throw the food! We have also been trying to give him water to drink from a beaker to eventually wean him off his bottle and we’ve been having some success with the Grip N Sip cup. 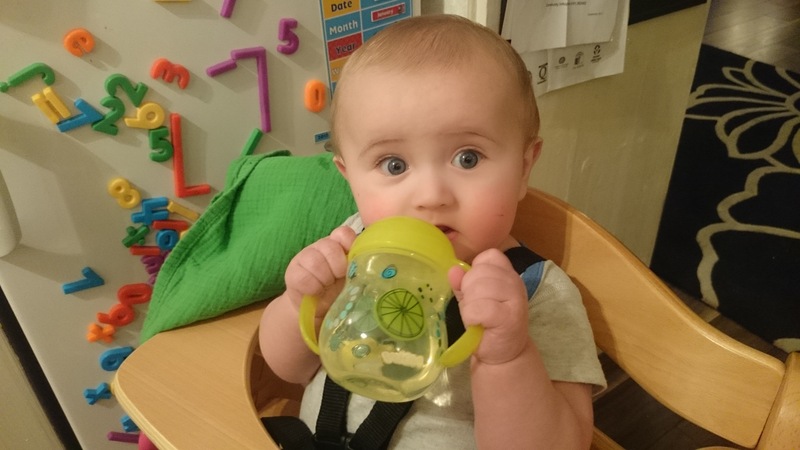 Its two handles are easy for him to hold and the Touch Flo spout means the drink comes out as soon as he compresses it a bit in his mouth, which seems a bit easier to master than some other no spill cups I’ve come across. 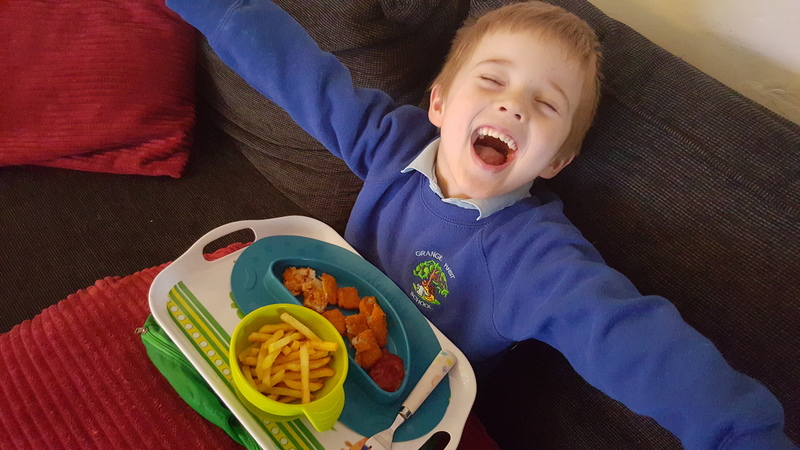 Oh, and it’s not just babies who can benefit from the Sure Grip non-slip feature – they are also ideal for fish fingers and chips in front of the TV! 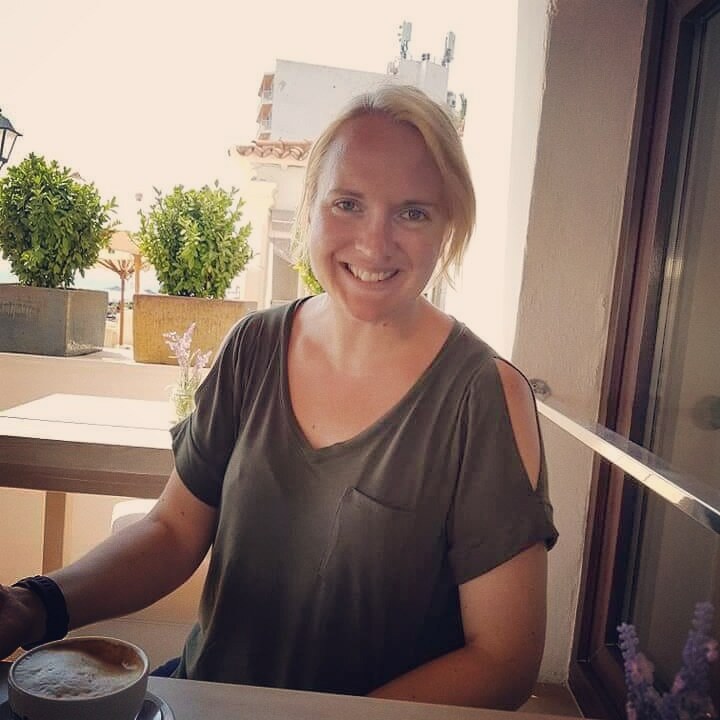 Nuby have been good enough to offer a voucher code worth £25 off any of their range at nuby-uk.com to one lucky winner of my competition. All you have to do is follow me @GreatNorthMum and @NubyUK on Twitter and Instagram and tag us in a photo of your little one telling us which product from the Nuby range is first on your Wish List if you win the voucher, using the hashtag #nubywishlist. I’ll draw the winner from all entries on Wednesday 4th May. Good luck!